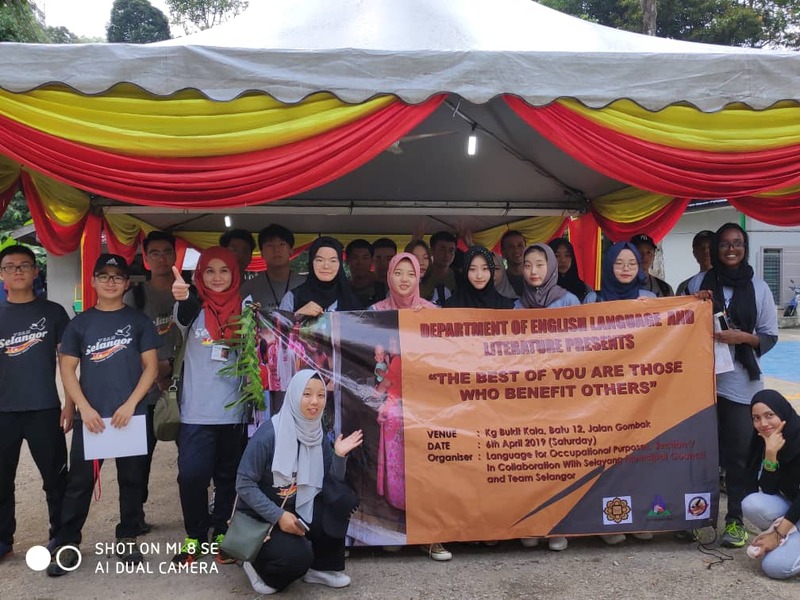 GOMBAK, 10 April 2019: “The Best of You Are Those Who Benefit Others’’, a programme aimed to integrate with neighbours of the International Islamic University Malaysia (IIUM) and to expose students to the aborigine’s culture, should be seen an exemplary model in social services. The programme that took place at Kg. Bukit Kala, Batu 12, Gombak last Saturday (6 April), was organised by Language of Occupational Purposes (LE 4501, Section 7) class with Dr. Ainul Azmin as the programme coordinator and Mr. Muhammad Zakwan as the advisor. It was a collaboration between IIUM and Majlis Perbandaran Selayang (MPS), Team Selangor, RELA, Agensi Anti-dadah Kebangsaan (AADK) and Jabatan Kemajuan Orang Asli (JAKOA). The guest of honour at the programme were the Head of Department of Language and Literature (DELL), Dr. Siti Nuraishah Ahmad, Dr. Ainul Azmin and Mr. Muhammad Zakwan, accompanied with the Chairman of Residential Committee Zone 1, MPS, Madam Norraidah A. Wahab.